For a portable and much affordable weather station it is advised to go for La Crosse Technology S88907. 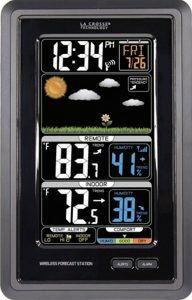 This device is a real technology for weather forecasting which much accuracy, displays data in animated color screen plus is very cheap compared to other weather station which have similar feature in the market today. This device is best for personal and home use only, not recommended for professional and meteorologist applications. This weather station is basically for those who are looking for an affordable weather forecasting device with all essential features to aid one in planning for the day’s activities with reliable predictions on the weather conditions. This weather forecasting device is designed to transmit signals wirelessly, with this there is no need for wire or cable connection for the transmission to take place. It is made with the remote sensor and it can wirelessly connected to the colored display screen. The weather condition once detected is transmitted to the display unit for you to see and take readings. The sensory unit of this weather station runs on 2 AA Alkaline (lithium) batteries with an estimated life span of 1 yr which is based on the brand of battery you are using, as some brands have quality batteries over others. The display system runs on 5.0V AC powered adapter and it has 3 AAA alkaline batteries cell for cases where backup is needed. It is recommended to use lithium batteries when the temperature falls below -29°C for the remote sensor. The batteries of the display unit are able to last for about 3 years when been used alongside the AC adapter. It is designed with compact sensor unit which is suitable for temperature and relative humidly measurement using the inbuilt thermometer and the hygrometer which give reliable readings. This weather station is also capable of taking indoor readings for certain conditions. It comes with a calendar and a 12 and 24-hour clock which can also be used for alarm setting, automatic time and date setting and also gives you notification when there is need for batteries replacement when the once inside are low with dew point and heat index readings as well. This weather station is one of the best low budget station one can find in the market, which is due to the fact that is has high performance rate compared to some other station which might be expensive. The weather station this therefore, considered cheap and also comes with a 1 year warranty from date of purchase which is safe for your investment. Been that this is an exclusive device with high performance in forecasting coupled with the fact that it is made wirelessly makes a more advantageous device than other weather stations plus it is affordable and easy to install without any form of professional mounting procedures. It’s disadvantages are not too alarming, it’s a wireless device so signal losses are not so high. Also it does not have the feature to connect to either a PC or a Smartphone and it is unable to detect rainfall and wind speed which happen to be some vital updates one would like to get. The La Crosse Technology S88907 may not be that classy with all the features but it is an ideal home weather station, one which is simple to use and above all affordable.